Check out the YouTube video by Dennis Skupinski that features the World War One Centennial: Strong Foundations New Possibilities exhibit! 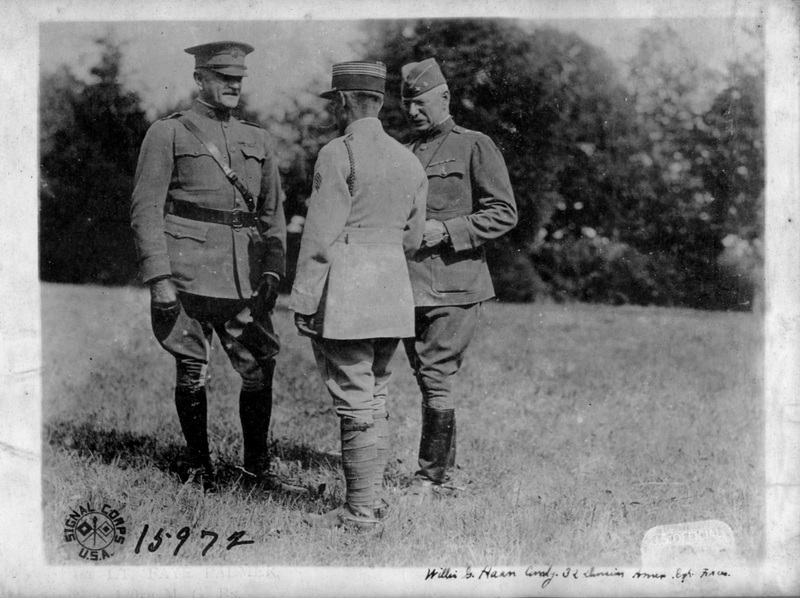 See photos from the walking tours and hear more about Michigan’s role in World War I.
Click here to see other ways the WWI Project has been in the news, including news articles, radio shows and TV interviews! 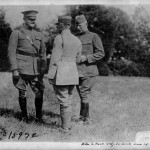 World War I Centennial: Strong Foundations, New Possibilities exhibit? Check out and download our Media Kit! Chelsea District Library is pleased to announce the receipt of grants from the Michigan Humanities Council (MHC) and the Community Tourism Action Plan (CTAP) Program for a World War I Installation and Digitization project scheduled for July – November 2016. 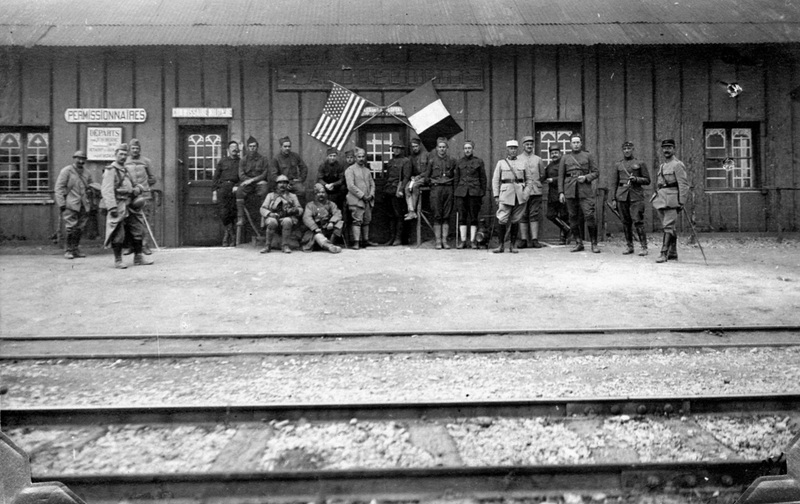 World War I Centennial: Strong Foundations, New Possibilities will be a physical and digital project on display in downtown Chelsea. 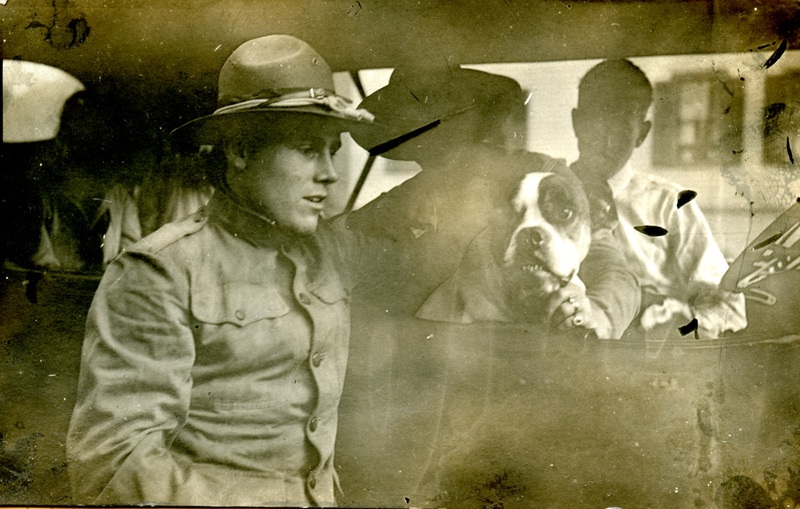 WWI era photographs, letters, stories, and artifacts will be curated to expand the historical record archived here on Stories of Chelsea. 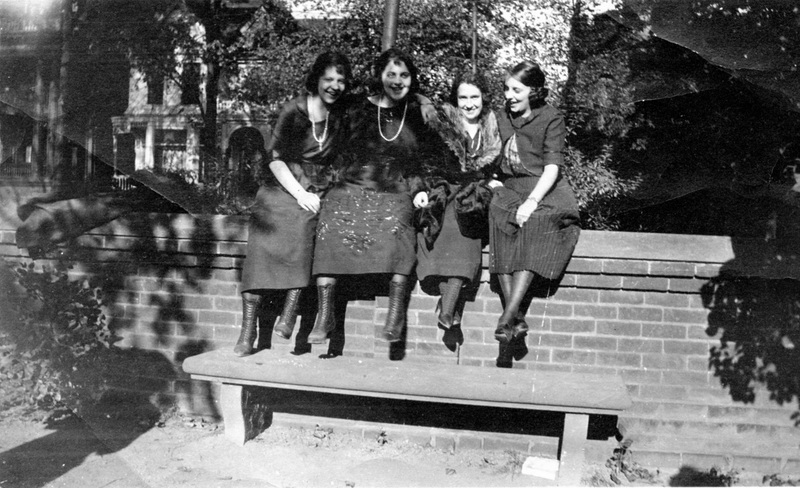 A selection of these digitized photographs will be enlarged and printed on outdoor banners for display throughout the Chelsea Downtown Chelsea. Our Ribbon Cutting Ceremony will be Saturday, July 30th at 11am at Chelsea District Library. Visit our section on World War I to find out more About the project and view some of the photographs and stories we have collected so far. This project is funded in part by Michigan Humanities Council, an affiliate of the National Endowment for the Humanities. The wait is over– the Historic Newspapers database has launched! You can search it by going to the Historic Newspapers tab on the top toolbar, or by clicking here. Although your first thought might be to search the Historic Newspaper Database for genealogy or historic research, tracking down birth and death notices or mentions of relatives, don’t stop there. It might also be fun to browse and explore the database without an end goal. See how a small town responded to WWII, Kennedy’s assassination, America’s Bicentennial and other noteworthy events of the past century. Or randomly pick an issue and read it in its entirety to truly get a sense of Chelsea’s daily life from a bygone year. Thanks so much to our many generous donors who made this digitization project possible! Final Years Up for Grabs – Sponsor the Historic Newspaper Project Today! 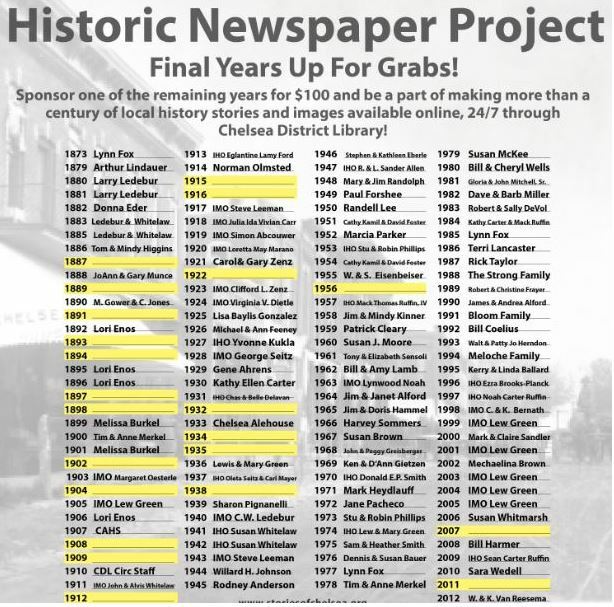 The Chelsea District Library is actively working to digitize all 134 years of Chelsea’s newspapers, making more than a century of local history stories and images available and searchable online, 24/7. We are taking newspapers preserved on microfilm and creating digital versions that can be stored and searched online, offering far greatly improved access to this resource than ever before.We hope to complete this project by fall 2014, and will then make it available here on StoriesofChelsea.org. This digitization project is a major undertaking, and would not have been possible without the support of the Chelsea community. At the cost of $100 per year, over 100 years have already found sponsors. There are still nearly 20 years available for sponsorship. Your $100 sponsorship gives another year of old news new life. For more information on the Historic Newspaper Project or to sponsor a year, contact Sarah Conrad sconrad@chelseadistrictlibrary.org or at (734)475-8732 ext. 228. Extra! Extra! Library Launching Historic Newspapers Project! The Chelsea District Library has 134 years of Chelsea newspapers on rolls of microfilm spanning from 1873 to 2012. Though the public can access these papers by coming into the library and using the microfilm reader, the process can be challenging and tedious. However, with support from the community, the Chelsea District Library is digitizing these newspapers, making them available online. Each microfilm roll will be scanned and put online, making them accessible 24 hours a day, from anywhere with internet access. Additionally, these digital copies will be keyword searchable—rather than sifting through years of microfilm searching for a story about a particular person, you can type their name and find their every mention with one simple search. “The technology that makes keyword searching possible has come a long way in recent years, so while it still may not be perfect, it is a huge improvement from going through page-by-page.” said Sara Wedell, head of adult services. Making Chelsea’s newspapers available online raises the profile of the community, as researchers from around the world will be able to easily access Chelsea’s history. But whether the historic Chelsea papers are used by an academic researcher working on a paper, or a curious Chelsea-ite looking for mentions of her grandfather, digitized versions of the newspapers will bring Chelsea’s history to the forefront. For more information on the Historic Newspaper Project or to sponsor a year, contact Sarah Conrad at sconrad@chelseadistrictlibrary.org or at (734)475-8732 ext. 228.